Three of the six counselors at Shepherd’s Washington Gateway Academy are graduates of the program. Pictured (l. to r.) are Nycole Cooper, a social work major from Romney; Haley George, a 2017 Shepherd graduate from Bunker Hill; and Kahlen Browning, a business major from Bolt. The Gateway Academy offers a weeklong, on-campus experience to rising ninth graders from West Virginia, Virginia, and Maryland to give them an idea of what attending college might be like. The 27th annual Shepherd University Washington Gateway Academy took place in July, giving 28 rising ninth grade students from West Virginia, Maryland, and Virginia the opportunity to spend a week on campus getting an idea of what college might be like. Six college-age counselors, including three who are graduates of the program, served as mentors to academy participants. 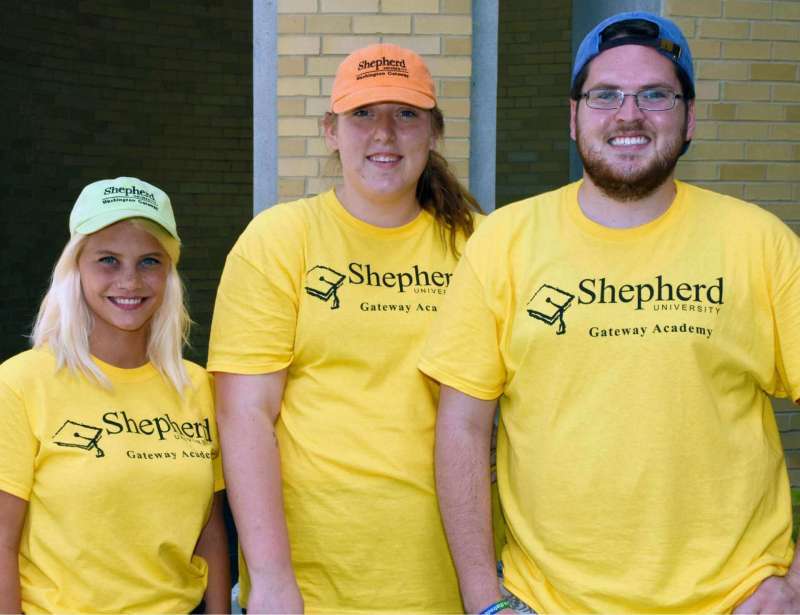 Current Shepherd students Kahlen Browning and Nycole Cooper and graduate Haley George all attended the Gateway Academy as middle school students and worked as counselors this year. They agree that participating in the Academy was a defining event in their lives that they hope to pass along to the current group of participants. Cooper said attending Gateway inspired her to finish high school in three years and attend college. She’s majoring in social work and hopes to go into child protective services and help other foster kids. Browning, who attended Gateway in 2008, grew up in Bolt, a tiny town in Raleigh County. Coming to Gateway as a middle school student influenced Browning to go to college and he said working as a counselor at the Academy is influencing what he’d like to do when he graduates. Browning wants to eventually work in leadership for a nonprofit youth organization. George is a 2007 graduate of the Gateway Academy and a 2017 graduate of Shepherd. Like Browning and Cooper, she is the first in her family to attend college. George’s goals are to earn a master’s degree, join the Peace Corps, and eventually teach college. She thoroughly enjoyed working as a Gateway counselor. Holly Morgan Frye ’09 M.A., assistant vice president for student affairs, who served as the director of Washington Gateway, said the Academy has been very effective in achieving its primary goal—encouraging students who might not have considered college to attend. “Gateway is important because of the impact it has on our future leaders,” Frye said. “I had the opportunity to speak to these students, to learn about their goals, and to see their reactions from visiting the Holocaust Museum, the Air and Space Museum, and having direct exposure to the nation’s capitol. This year the program received financial support from Women Investing in Shepherd (WISH), which gave Gateway a $20,625 grant to conduct the Academy. Additionally, money was raised in support of the academy through a fundraising event to honor Dr. John “Quincy” Adams ’71 and ’73, one of the creators and a longtime director of the program, and the Frada Fine Scholarship Fund, BB&T Trustee, donated $4,000.